Things Fall Apart is a literary novel written by Nigerian author Chinua Achebe in 1958. The story's main theme concerns pre- and post-colonial life in late nineteenth century Nigeria. It is seen as the archetypal modern African novelin English, one of the first to receive global critical acclaim. It is a staple book in schools throughout Africa and is widely read and studied in English-speaking countries around the world. It was first published in 1958 by William Heinemann Ltd in the UK; in 1962, it was also the first work published in Heinemann's African Writers Series. The title of the novel comes from a line in W. B. Yeats' poem "The Second Coming". The novel follows the life of Okonkwo, an Igbo ("Ibo" in the novel) leader and local wrestling champion in the fictional Nigerian village of Umuofia. 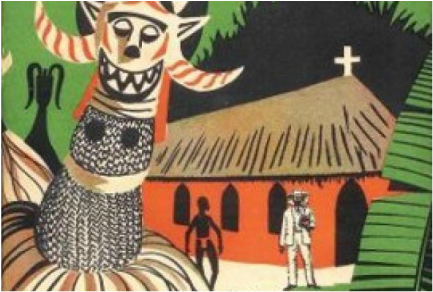 The work is split into three parts, the first describing his family and personal history, the customs and society of the Igbo, and the second and third sections introduce the influence of British colonialism and Christian missionaries on the Igbo community. When you consider the society of the Ibo it is almost inevitable that their society would crumble eventually. The impacts of colonialism tore apart families and disrupted the one common thread that connected all of the ibo people, their common religion kept all of them form destroying each other. “Blessed is he who forsakes his father and mother for my sake.”(p.152) This quote exemplifies the influx of christianity into Umuofia. The people who differed form normality tended to start gravitating towards the white man. Women who tended to conceive twins, which were later mercilessly thrown into the bushes to die left, children like Nwoye who didn’t quite fit into their more aggressive families abandoned them for a new life. “At first the clan had thought it would not survive. But it had gone on living and gradually becoming stronger.”(p.154) In this statement they talk about the church as a metaphor for the new and prominent religion that is sweeping the clans. The people gave the colonists the evil forest in hopes that it would kill them. When they eventually became an impressive and strong group, I feel that people began to lose faith. I feel that Chinua Achebe was very successful in giving another look at Africa then the one we are used to seeing. The Ibo clans were very advanced in their own rights. They have an established way of life and that in itself is very impressive. “The nine villages of Umuofia had grown out of the nine sons of the first father of the clan.”(p.89) In the nine villages there are communities, farmers and a jury to solve problems. We as an American’s still follow all of these. “And she guessed that they must be on the village ilo, or playground.” The idea of an uncivilized group of people doesn’t tend to have a system of law and order, playgrounds, and people growing their own food. I feel very strongly that we need to have more perspective in our books. During this seminar I learned a lot about what is taken form this book through many different lenses. One comment ally made really made me think a lot she said “Think about why africans didn’t colonise and push their ideas on the westerners.” I never thought about why they didn’t colonise and it all kind of boils down to that they probably didn’t think that this was an acceptable thing to do. So why did the easterners think that it was their place to force beliefs onto the people that they saw as lessers. I think that this comment changed my perspective on dominance and submission. These are core traits in this story and it is very important that Okonkwo thought that it was his job, while the rest of the clan thought that they were outmatched. This seminar in itself gave me a lot of insight into the views of my peers and my teacher.